Offering my services - sort of! Re: Offering my services - sort of! Says the only volunteers needed are SE Kent ones and I am not from there. Sarah, slave to the 4 legged furball gang! 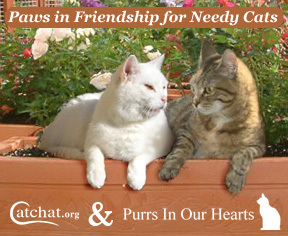 catchat need volunteers for all sorts of updating hun not just monitoring the forum board. cant hurt to ask?? I dont really post on CatChat so don't think the administrators would know me well enough and trust me well enough to help with the boards there. Just as a thought, have you offered your services to CatChat because I think they are often looking for volunteers with computer access etc. I would take you up on your offer because since setting up my website I have done no editing to it at all, but I think I would be as bad at getting the information to you as I am to up-dating it myself. However much I want to help in the actual rescues its proven impossible with my recent treatment and now with the pregnancy and twins on the way its never going to happen but what I can do is help online somehow. I am not a computer programmer buit if maintaining your website is easy enough and you just are not getting the time then I am happy to do that or any other way needed. Or if there is some way I can help your rescue with paperwork, etc just shout ok. Offering my services now, throughout maternity leave and even when the twins arrive as I'll need to keep my sanity and this is the way.